We Ambuja Tube Fitting is one of the leading manufacturers, suppliers and exporter of Cupro Nickle Round Bar.The Copper Nickel Round Bar are made with best quality materials and known for their features like high tensile strength, strong, corrosion to resistance, efficient functionality. These Rods are traded to our clients all across the world. 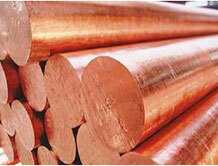 The Addition of Nickel to Copper Improves Strength and Corrosion Resistance But Good Ductility is Retained. Copper-nickel Alloys have Excellent Resistance to Marine Corrosion and Bio fouling.